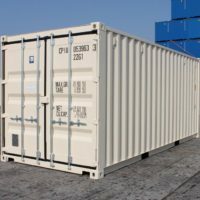 Shipping Containers are received and graded based on their conditions – there are generally 4 different types of shipping container grades, and we’ve put together a list of each type with each name it is known as. After the container reaches it’s location, the container is emptied and taken by truck to an empty container yard. The container is then surveyed at length to be graded and checked, before being made available for resale. 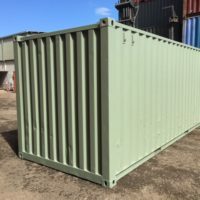 These are the best quality containers – they’re referred to as Brand New, because of the minimal time spent being moved by forklifts, on and off ships or trucks and limited sea or salt spray. There will be minimal to no dents, scratches, cargo marks or surface rust. These containers are strongly recommended for any container that will have modifications done – especially if you will be building with the container – i.e. a Shipping Container Home or Pool. This is also a great option if you don’t want the hassle of maintenance, or the aesthetics of a lower grade container. Good quality, clean interior, any surface rust is buffed and primed, door seals intact, fully welded, vermin proof, wind and watertight. Container is between 8 – 12 years of age. All doors, doors seals and locking bars would be checked and repaired as required. Suitable for furniture storage, office archives, books and antiques. 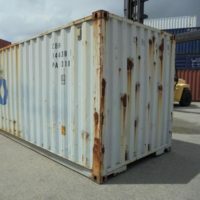 Containers are second hand, or used containers that can be surveyed (if not still in survey) and certified to be structurally suitable for rail and ocean freight of cargo. To be graded, the container has been passed fit based on a number of universal inspection criteria the criteria relate directly to the condition of the container doors, floor condition, walls, ceiling, paint condition and structural integrity. Structural integrity is main factor when it comes to certification of shipping containers. B Grade Containers all have imperfections, some worse than others. The aesthetic appearance of these containers will vary, you will never find two cargo worthy containers in the same condition, with the same blemishes, dings, scratches and cargo marks. Suitable for garden sheds, tools, boxes, motor vehicles and any other items that require secure dry storage. Although of fair quality, dents and surface rust can be present, container is not wind and watertight. Container is usually over 15 years of age. These containers have not been through any stringent survey process upon gating into our depots when the shipping lines decommission (Retire from shipping life) the container. AS IS containers are often decommissioned due to structural flaws in the container integrity. 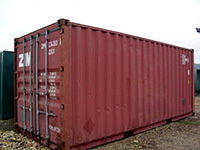 These containers are used and retired containers, they will have surface rust in varying conditions where the factory paint has been rubbed, scuffed or scratched, and will often come with delaminating and stained flooring in sections, as well as shipping line and empty container yard labeling.